I love this very much. I do, indeed. 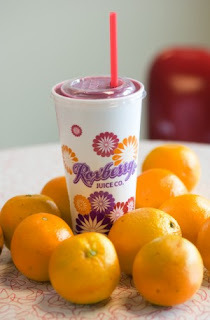 In fact, over the course of the past 6 weeks, I've loved these Roxberry Juice smoothies 21 times. Where else can you get 32 ounces of orange/strawberry/banana nutrishyum for only 304 calories? We have developed quite the relationship, Roxberry and I, and we hope to be together for some time to come. Monday nights are buy 1 get 1 free. Who could ask for anything more? Not this girl. Next Monday, I'm going to celebrate with you.